The rural people in Pakistan are mainly poor peasants and daily labourers. Few of them own land, it has been bought or obtained by wealthy people. The average person struggles to make a living. There is a great deal of hardship. Most Christian people in these areas are at the bottom of the food chain, the poorest of the poor. This partnership seeks to help them by training women to sew thus enabling them to increase their household income and at the very least to save money on their costs. For a number of years BHW has been partnering with Azam and Barbara Gill. Azam comes from this rural area near to Faisalabad. When visiting his family and the Christians there he started to wonder how he could help them. The first village is about 70 km from Faisalabad and village number 2 is 125 km from Faisalabad. These villages do not have names, just numbers. 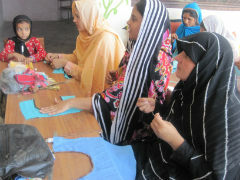 For about five years Azam and Barbara have been organising sewing programmes around Islamabad and they have seen the changes that come when the women are trained to sew. They explored the possibility of doing something similar in this rural area. In 2013 a pilot programme was commenced with the intention that it will become a regular programme in different villages from year to year. This is the very first time someone has commenced any development, training or anything like a sewing centre in the village since it was founded. The people of the villages, both men and women, are very happy that their women will benefit from the training which will help them to earn some rupees. The direct beneficiaries will be the women who learn this new skill. The secondary beneficiaries will be the families of these women who will be able to save costs on their own clothing and make a little income from other people. Initially Christian people will be given preference, but others will be allowed to participate as well. In the first course there were 13 Moslem women and 7 Christian women. This programme is aimed at the poorest of the poor. Most of them struggle to live. It also assists the minority people in this community to gain some dignity by learning new skills. In addition it forms a basis for other ongoing involvement with the community to bring other forms of development. It assists Azam to contribute to the community and in doing so engage the leaders in conversation, not an easy thing to do without a reason. It is certainly addressing a felt need in the willage. A tutor has been employed to teach the women. Her name is Mrs Gulshan Akhter. She is a Moslem lady who has been trained as a sewing teacher and has some experience. 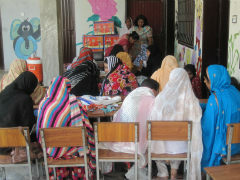 The strategy is to run two or three sewing projects in different villages around Faisalabad. It is dependant on finding villages that want the programme and tutors. Each person who graduates receives a sewing machine so they can immediately commence sewing. The budget for a project in a village is around $US2,200 per village per year and they are currently being run in two villages.